Why are some organizations more innovative than others? How can we tap into, empower, and leverage the natural innovation within our organizations that is so vital to our future success? Now more than ever, companies and institutions of all types and sizes are determined to create more innovative organizations. In study after study, leaders say that fostering innovation and the need for transformational change are among their top priorities. But they also report struggling with how to engage their cultures to implement the changes necessary to maximize their ?innovative targets. 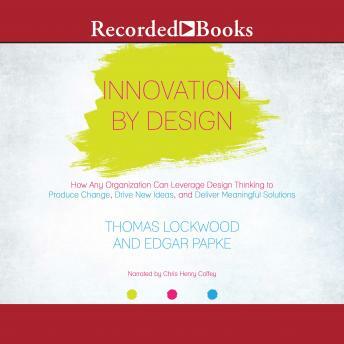 In Innovation by Design, authors Thomas Lockwood and Edgar Papke share the results of their study of some of the world's most innovative organizations, including: - The 10 ways leaders can create and develop effective cultures of innovation. - How to use design thinking as a powerful method to drive employee creativity and innovation. - How to leverage the natural influence of the collective imagination to produce the "pull effect" of creativity and risk taking. - How leaders can take the "Fifth Step of Design" and create their ideal culture. Innovation by Design offers a powerful set of insights and practical solutions to the most important challenge for today's businesses-the need for relevant innovation. Author bios: Thomas Lockwood is the author/editor of the books Design Thinking, Corporate Creativity, and Building Design Strategy. He has a PhD in design management and is recognized as a thought leader at integrating design and innovation practice into business. He has produced 22 conferences about design leadership, lectured and led workshops in over 20 countries, and is a design adviser to numerous companies. Edgar Papke is a leadership psychologist, author, and globally recognized expert in business alignment, leadership, and organizational culture. His clients range from Fortune 500 companies, multinational organizations, and governments to small businesses and individuals. He is an award-winning speaker and the author of True Alignment and The Elephant in the Boardroom.